Give your walls a touch of bling with this range of ten abstract designer finishes. Available in a subtle glaze finish and a range of multifaceted looks, this range is a celebration of uniqueness. With its minute details, the Weaving effect gives your walls the freshness of linen fabrics. With mysterious folds and bends, the Dapple effect is as versatile as you want it to be. Bring home the mystery of the sea with a Sponging effect that mimics the coastline. Get artistic and give your walls brush strokes of deep hues with the Brushing effect. 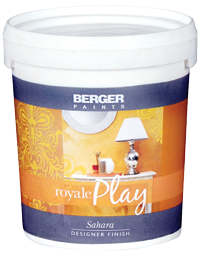 Known for its artistic blend of colours, this finish turns your walls into a canvas to play with. Made with tissue paper, this effect mimics a rustic wall and gives it a never-seen-before texture. Colour Wash creates an atmosphere of drama with hazy lines that look like wisps of smoke. 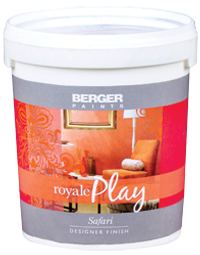 A faux-finish that feels like fabric, Ragging gives your walls a delicate, hand-made look. Have fun with the Combing effect that mimics the fluid sheen of silk with vertical stripes. With an earthy palette, the Spatula effect creates a rustic feel and a warm, inviting atmosphere. 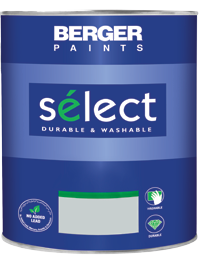 Surface preparation Clean the surface and prep it with one coat of Berger AR Primer and two coats of Berger Stucco. Application procedure Base Coat: Apply two coats of Royale Silk in the recommended shade. Top Coat: Wet the wall with a flat sponge for absorption and easy application. 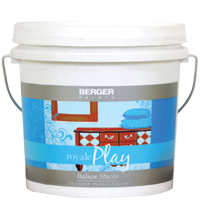 Apply Royale Play Glaze in manageable sections using the recommended tool. Thin with Solvalux – 1. Tips: Stand back and look at the wall regularly to make sure it is uniform. Watch this demo for techniques, tools, and tips to apply these unique designer finishes.